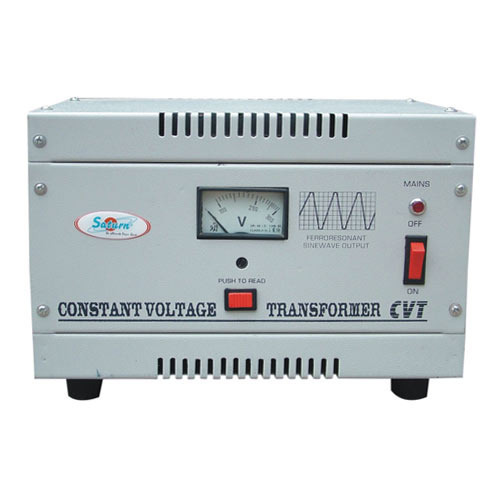 A device that gives you a steady and regulated flow of voltage output is called Constant Voltage Transformer (CVT). The device safeguards electrical appliances from the harms of power fluctuations. Constant Voltage Transformer dealer in Chennai helps to control the variation in voltage output. There has been advanced in the transformers over the years with finer refinements in its functionality. The transformer is designed for various applications that demand constant voltage to run machines like photo typesetter, X Ray machines, fax machines, color photography labs and more. There are two types of CVTs; single and three phase. CVT is a non-linear supply ensuring the voltage does not move out of the predetermined voltage regulation zone. CVT is engineered to function during core saturation condition. It means that the iron core is loaded with magnetic lines to a greater portion of AC cycle in a way that the supply voltage has very little effect on the magnetic flux density. The device is passive as it does not require any feedback circuits for monitoring or adjusting to the prescribed voltage regulation. Modern CVT are known as Ferro as it uses electronic control to enhance the voltage regulation less than 1%. This type of transformer uses filament upon the oscillator tubes or type circuit or lamps utilized for the purpose of picture development where it is critical to be a light output. The CVT was devised by Joseph Sola in the year 1938 and is one of the largest selling transformer units every year. The CVT has undergone a lot of improvements yet the fundamentals are undisturbed. Though it is a single phase gadget it can be used with two or three giving the ferro benefits particularly in three phase application. It does not have any moving parts or semiconductor and hence highly dependable. It offers better voltage regulation despite the variation in voltage regulation from 1 to 4%. It can be customized to meet the constant current output Vs. the voltage supplied to normal devices. It is highly durable and does not come with any moving part facilitating easy maintenance allowing them to work longer hours without any snags. It can regulate output voltage of upto 60% for a particular period during voltage drop. Though, it does not offer good resistance when there is temporary voltage interruption or during very intense voltage drops. It comes with special features and with tank circuit design. It is a combination of an inverter and UPS application. Moreover, it offers uninterrupted transfer to secondary source. Incase of an overload or fault it comes handy. Even during complete inverter failure it helps to maintain the power load. It helps to supply constant current output instead of constant voltage. During load current going over 150% of the rated region, there is a collapse in the output voltage in a limited value thereby limiting the current. There are a host of devices used in various industries depending on their application. Another prominent transformer includes Automatic voltage regulator or AVR and dry type. The role of these devices is to provide constant voltage output bfy protecting the equipment from power fluctuation risks and power cuts. CVT not intended to serves industries and other facilities suffering from power fluctuation or quality power. For better response it has to be used in combination with TVSS and UPS for effective mitigation.